Athletes attend by invitation only. Implications of an athlete's performance during the combine can affect their draft status and salary, and ultimately their career. The draft has popularized the term "workout warrior", whereby an athlete's "draft stock" is increased based on superior measurable qualities such as size, speed, and strength, despite having an average or sub-par college career. 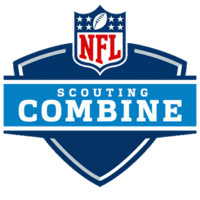 The 2016 NFL scouting combine occurred from February 24–29, 2016. Tex Schramm, the president and general manager of the Dallas Cowboys from 1960 to 1989, proposed to the NFL competition committee a centralization of the evaluation process for NFL teams. Prior to 1982, teams had to schedule individual visits with players to run them through drills and tests. The national invitational camp (NIC) was first held in Tampa, Florida, in 1982. It was originated by National Football Scouting, Inc. as a means for member organizations to look at NFL draft prospects. For non-member teams, two other camps were created and used 1982–1984. The NIC was renamed the NFL scouting combine following the merger of the three camps in 1985 to cut the cost of running the extra camps. The NIC was held in New Orleans, Louisiana, in 1984 before the merger. It was held in Arizona in 1985 and once again in New Orleans in 1986 before permanently moving to Indianapolis in 1987. The NFL is now questioning the drills and may change them in the next few years. As of the 2015 season, eighteen franchises participate in The National (Arizona Cardinals, Atlanta Falcons, Carolina Panthers, Cincinnati Bengals, Dallas Cowboys, Denver Broncos, Green Bay Packers, Houston Texans, Kansas City Chiefs, New Orleans Saints, New York Jets, Philadelphia Eagles, Los Angeles Rams, San Diego Chargers, San Francisco 49ers, Seattle Seahawks, Tampa Bay Buccaneers, and Tennessee Titans), with eight served by BLESTO (Buffalo Bills, Detroit Lions, Jacksonville Jaguars, Miami Dolphins, Minnesota Vikings, New York Giants, Pittsburgh Steelers, and Washington Redskins). Each of the six non-affiliated teams (Baltimore Ravens, Chicago Bears, Cleveland Browns, Indianapolis Colts, New England Patriots, and Oakland Raiders) relies on its in-house scouting staffs. In a typical year, there are about 335 invited players. About 250 invitations are sent before bowl games are completed to those who have completed their seasons. However, underclassmen have until mid-January to confirm their draft status. Invitations are made to those receiving supermajority support from the selection committee. The first NFL Veteran Combine was scheduled on March 22, 2015 at the Arizona Cardinals's team facility. The combine corresponded with the NFL owners' meetings also being held in Phoenix from March 22-24, 2015. The combine featured veteran free agents, and all 32 clubs in attendance. There were over 2,000 applications from players to participate, although only a select few were chosen. Some of the notable players included Adam Carriker, Felix Jones, Michael Sam, and Brady Quinn. However, only two players participating in the combine (linebacker Brandon Copeland and tight end Ifeanyi Momah) were still on NFL rosters by Week 1 of the 2015 regular season. ↑ "Beaver County Times – Google News Archive Search". google.com. ↑ Schoenfield, Dave (April 27, 2006). "The 100 worst draft picks ever". ESPN.com. Retrieved February 25, 2012. ↑ Cheifetz, Isaac (2007). Hiring Secrets of the NFL: How Your Company Can Select Talent Like a Champion. p. 68. ↑ Eisen, Rich (2007). Total Access: A Journey to the Center of the NFL Universe. p. 128. ↑ "2015 NFL key dates". ESPN.com. December 17, 2014. Retrieved May 7, 2015. 1 2 Crouse, Karen (February 23, 2007). "Players Are Seen and Unseen At N.F.L. Scouting Combine". New York Times. Retrieved February 26, 2012. ↑ Mitchell, Fred (February 5, 1991). "Where millionaires are separated from the boys". Chicago Tribune. Retrieved February 25, 2012. ↑ Chappell, Mike (February 24, 2012). "NFL Combine: Colts proceed with caution on Manning". Indianapolis Star. Retrieved February 25, 2012. 1 2 3 4 5 6 7 8 "Workout & Drills". NFL.com. Retrieved February 25, 2012. 1 2 3 4 5 "The NFL Scouting Combine". theredzone.org. Retrieved February 25, 2012. ↑ Casserly, Charley (February 24, 2012). "Wonderlic Test is helpful, but certainly not a foolproof tool". NFL.com. Retrieved February 25, 2012. ↑ Ledbetter, D. Orlando (February 25, 2011). "NFL's physical testing methods scrutinized". Atlanta Journal-Constitution. Retrieved February 25, 2012. ↑ Lyons, B. D.; Hoffman, B. J.; Michel, J. W.; Williams, K. J. (2011). "On the Predictive Efficiency of Past Performance and Physical Ability: The Case of the National Football League". Human Performance. 24 (2): 158. doi:10.1080/08959285.2011.555218. ↑ "Combine events: Bench press". NFL.com. ↑ "bench press – NFL Combine Results". nflcombineresults.com. ↑ "McClain: 40 times fuel combine conversation". Houston Chronicle. 1 2 "Butler's retirement marks the end of a BLEST career – Pittsburgh Post-Gazette". Pittsburgh Post-Gazette. June 10, 2007. 1 2 3 4 "Who Are BLESTO & The National?". DraftDaddy.com. Retrieved February 25, 2012. ↑ Marino, Tom (December 10, 2008). "The Scouting Combine's Role in Pro Scouting". Scout.com. Retrieved February 25, 2012. ↑ Gabriel, Greg (December 30, 2011). "Q A on NFL Scouting Combine invites". National Football Post. Retrieved January 19, 2012. 1 2 Silverman, Steve (February 21, 2012). "Silverman: NFL Combine Is Overrated". CBS Chicago. Retrieved February 3, 2014. ↑ Tatum, Doug (March 15, 2009). "40-yard dash is just a waste of time for NFL prospects". The Times-Picayune. Retrieved February 3, 2014. ↑ "NFL draft: Is the 40-yard dash really that important?". mercurynews.com. ↑ Wood, Skip (February 18, 2004). "NFL opens combine to curious cameras". USA Today. Retrieved February 26, 2012. ↑ Sandomir, Richard (February 3, 2005). "The NFL Network Wants You to Want It". New York Times. Retrieved February 26, 2012. ↑ Clayton, John (February 25, 2005). "Combine should be one of the busiest ever". ESPN.com. Retrieved February 26, 2012. ↑ "NFL Combine accompanied by hazy labor outlook". USA Today. February 23, 2006. Retrieved February 26, 2012. ↑ "Exclusive coverage of NFL Combine on NFL Network, NFL.com". NFL.com. 2009. Retrieved February 26, 2012. ↑ "NFL Network, NFL.com to provide exclusive combine coverage". NFL.com. 2010. Retrieved February 26, 2012. ↑ Hiestand, Michael (February 25, 2011). "Combine: NFL niche that runs way over". USA Today. Retrieved February 26, 2012. ↑ Vensel, Matt (February 11, 2012). "Regional combine provides another road to the NFL". Baltimore Sun. Retrieved February 25, 2012. ↑ Breech, John (January 15, 2015). "NFL adds event: Veteran combine for free agents to be held in March". cbssports.com. Archived from the original on January 16, 2015. Retrieved January 16, 2015. ↑ Alex Putterman. "NFL cancels veteran combine due to lack of interest". Yardbarker. Retrieved April 8, 2016. ↑ Michael David Smith. "NFL shelves the veteran combine". Pro Football Talk. Retrieved April 8, 2016.